This gentle, yet powerful technique uses a simple, systematic method of massaging specific essential oils along the spine/back and feet. It quiets the central nervous system and stimulates energy points. It brings the body back to a balanced state, reducing stress, inflammation and toxicity levels. Very soothing, restorative—and pleasant to the senses! 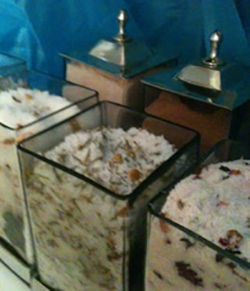 Enhance your massage session with a sensory journey. Begin by choosing a special essential oil blend suited to your mood of the day! We’ll use these oils in your massage to create a subtle, yet profound overall feeling of well-being. Whether you need to feel at peace, more balanced, or more uplifted–the aromatherapy blend you select will make the difference! So, come in and indulge yourself with this new aromatic experience! Come alone or with a friend or partner. Perfect for Athletes, Waitstaff, Nurses too! For that special day, congratulations, or birthday surprise, we’ll create a custom package (any combination of services for the Face, Body, or Spirit) in the form of a gift certificate…all wrapped up with a bow! Enjoy 1 hour of Face + 1 hour of Body = 2 hours of Spirit in the same visit! Restore what the elements take away with 1 hour of nourishing skin and hand care, plus a 1-hour massage! Indulge in a 1-hour massage for expectant moms as well as a 1-hour facial to nurture hormonal skin. Teach your teen to properly care for his or her skin with a 50-minute facial and de-stress with a 50-minute massage! Soothing 1-hour massage & rejuvenating 50-minute facial for the bride-to-be. From the beginning of early civilization, aromatic plants and aromatherapy have been used for therapeutic properties. Egyptian papyri and Chinese manuscripts describe the medicinal use of aromatics employed thousands of years ago. The Egyptians placed a great value on aromatic oils and even included thirty-five alabaster jars of oils in King Tutankhamen’s tomb. Similarly, the Greeks attributed the invention of perfumes to the gods and believed all aromatic plants to be of divine origin. Additionally, there are many references to aromatics, ointments, and incenses (such as frankincense, myrrh, rosemary, etc.) in the Bible and the Torah. Hippocrates (commonly referred to as the “Father of Medicine”) studied the effects of plant-based essential oils on health and promoted their use for medicinal benefits.The properties of essential oils, whether inhaled or applied to the skin, activates the olfactory tract, which then effects the limbic system of the brain. The limbic system is responsible for processing and storing emotion, memory and smell. Studies have shown that essential oils can be a powerful key to help release stored stress and emotional trauma.